Andrew Wilson is the Executive Director of the Center for International Private Enterprise (CIPE) in Washington, D.C. Wilson has extensive experience working with the private sector on development issues in conflict and post-conflict settings, crafting successful business strategies to reduce corruption, encouraging entrepreneurship development, strengthening business advocacy, improving corporate governance standards, and promoting economic reform. He is called on frequently to speak about the linkages between democracy and business, as well as the challenges to growth in emerging markets, including corruption and the threat of corrosive capital. 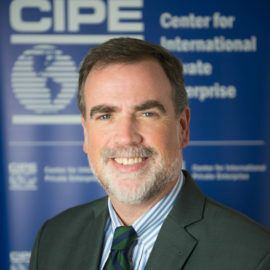 Wilson has worked at CIPE since 1996 in a variety of roles, including Deputy Director for Strategic Planning and Programs, and Regional Director for Europe, Eurasia, and South Asia. Prior to his time at CIPE, Wilson worked for several development NGOs focusing on economic reform, private sector growth, and public diplomacy. Over the years, Wilson has served on numerous international working groups dedicated to political and economic development in transitional societies. He has also worked with non-profit boards to improve strategic planning and optimize organizational development. He is currently a board member of the Baltimore and Ohio Railroad Museum in Baltimore, Maryland and is a Director and Trustee of the Meadows Foundation in Dallas, Texas. Wilson received his MA in East European Area Studies from the University of London (SSEES) and a BA in History from Lewis and Clark College. Follow Andrew on Twitter.